"Private, non-denominational Marist College offers its 4,850 or so full-time undergraduates "a solid liberal arts education with a career-oriented focus." The campus in Poughkeepsie, NY (which is midway between New York City and Albany) offers a picturesque view of the Hudson River. Looking to transfer? Marist has one of the more flexible transfer policies around." Describe the type of student who should not attend Marist College and explain why. Describe the type of student who should attend Marist College. Why? What is a typical Marist College student like? Describe the type of person that should attend Marist College. A typical Marist student is very out spoken and nice to approach. He or she get involve in all activities on campus and makes sure that others are being help on campus and out of campus. 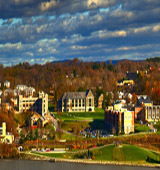 What are the top 3 reasons someone should attend Marist College? What was a typical Marist College student like in high school? Describe the type of person that should attend Marist College. Those lacking academic bona fides will have to make it up in other areas. Encourages in-class participation as well as out-of-class discussion. Marist College, recognized for excellence by U.S. News & World Report, TIME Magazine and the Princeton Review, and by Barron's Best Buys in College Education, is noted for its leadership in the use of technology to enhance the teaching and learning process. What started as a school for the training of future Marist Brothers has developed into one of the leading colleges of the arts and sciences in the Northeast. Marist is ecumenical in character and reflects the ideals of the founder of the Marist Brothers, St. Marcellin Champagnat: commitment to excellence in education, a pursuit of higher human values, and dedication to the principle of service. Marist is dedicated to the development of the whole person in a way that will prepare our graduates for an enlightened, sensitive, and productive life in the global community of the 21st century. What are the top 3 things that students do for fun at Marist College? The top three things that Marist student do for fun are to go out during the weekend , have a movie night on campus, and host a block party on campus. A program that focuses on the application of psychology to the study of the behavior of individuals in the roles of teacher and learner, the nature and effects of learning environments, and the psychological effects of methods, resources, organization and non-school experience on the educational process. Includes instruction in learning theory, human growth and development, research methods, and psychological evaluation. 25% of students graduated in the top tenth of their class. The average student pays $33,526 for tuition, fees, and other expenses, after grants and scholarships. Total stated tuition is $30,700, in-state and on-campus, before financial aid. 86% of students receive some form of financial aid. Learn more about financial aid at http://www.marist.edu/financialaid/. Estimate the net price for you at http://marist.studentaidcalculator.com/survey.aspx. 69% of students graduated on time. 90% of full time students continued studying at this school after freshman year. The typical (median) early career salary of Marist College graduates is $43,000, according to Payscale. Marist College participates in the NCAA Division I-AA for college athletics. Want more info about Marist College? Get free advice from education experts and Noodle community members. What can Marist transfer students expect when they arrive on campus? Welcoming students who are ready to make a new person feel at home. A transfer will easily fall into place and feel like they have been at Marist forever. What are three fun facts about Marist that someone attending your school next year should know? What are three Marist events everyone should know about? Can you name top restaurants near Marist ? What are 10 things you wish you knew before attending Marist? How do you make the most out of your experience at Marist? It is important to always keep an open mind and take advantage of all the opportunities that come your way! What are the three questions a prospective student should ask on the Marist campus tour? Why did you choose Marist? – this will give you more personal reasons for why you want to attend. What do you know about _ major? – this will give you more insight about what you want to study. What advice would you have for someone thinking about going to Marist? Come to campus and take a tour. Talk to students who attend Marist in your prospective major and see what they think/ask them questions. Research the campus and talk to people in admissions. What are some words of advice you would give to a Marist freshman? Don’t be nervous and enjoy every single second because the first year goes by soooo fast! What are some Marist activities students can participate in to feel part of the greater Marist community? There isn’t a specific activity to participate it. I’d say just having school pride and making connections on campus would make you feel a part of the community. What are Marist sports like? Intramural sports? Varsity teams? Sports are big on campus, especially intermural sports. That being said, it is not uncommon for students to not be involved in sports. What is Marist dining like? What kind of Marist work study jobs can I get on campus? What are some student jobs I can find on campus? Jobs include working in Student Financial Services, Registrar, the library, or with Dining Services. What are some Marist off-campus housing options? There are apartments or houses for rent. What are the Marist dorms like? What can you say something about the Marist public safety? Public safety is awesome. They always make me feel secure on campus and are willing to walk you around to where you are going on campus if you feel unsafe at night. Are there Marist tutoring services? Yes. Students who maintain an A- or higher are trained to tutor in specific subjects. There is also a proof-reading center on campus. Describe your freshman year at Marist? How does the Marist health center help students with stress management? The health center is always there to help with stress. There are therapists on hand to listen and help students sort out their stress. How would you rate Marist student health center services ( mental, emotional, physical services) ? Health Services is great. They are always available to help students who are not feeling well physically or emotionally. There is free counseling and nurses are always ready to help cure any illnesses you may have. Is there student activism on Marist campus? Can you tell me more about it? Where can Marist students go to watch concerts? What artists have visited campus? Marist is located very close to The Chance, a theater that many artists come and play at. On campus we have had Big Sean, The White Panda, The Goo Goo Dolls, and many others! Are there services for Marist commuter students? There are not many commuters on campus, though we do have designated areas for commuters to hang out between classes, and there is even a council that plans activities for commuters. How big is sports at Marist? How excited do students get about them? Our biggest sport is probably women’s basketball. Our school is crazy for them and get very amped up about games. What Marist clubs can I join? Can you tell me how to get involved on campus at Marist? I would say definitely attend the club fairs at the beginning of each semester. Each club has a booth and people who are available to answer questions and help you join the clubs you are interested in! How does Marist career services help students in find a job after college? Career Services has many connections to companies that are well known and work by helping students get recognized and hired for jobs. I have always wanted to join a sorority. What is Marist Greek Life like? Marist doesn’t really have Greek Life. There are a few sororities and fraternities, but majority of the students are not involved, yet there is still the option if you would like to join. Do Marist advising offices help you choose your major? What are the most popular Marist majors? Probably Communications or Fashion Merchandising. Marist offers many options in the communications sector of learning. We are also one of the few schools to offer Fashion Merchandising and Fashion Design majors in the US. What is there to do on the weekend at Marist? Do most Marist students go away on weekends or stay on campus? Many people stay on campus. Because majority of the students come from New Jersey, Long Island, New York, and Connecticut, students stay on campus, but have the option to go home for the weekend if they would like. Are there any good Marist off campus housing options? Is moving off campus something Marist students do? How difficult is it to be accepted to the freshmen Marist Italy program? What is a typical day for a student in the Marist Italy program? does marist offer esl classes ? At the moment there are no American Sign Language courses at Marist; students usually take them at Dutchess Community College or SUNY New Paltz.